Skeletal muscle is the type of muscle that we can see and feel. When a body builder works out to increase muscle mass, skeletal muscle is what is being exercised. 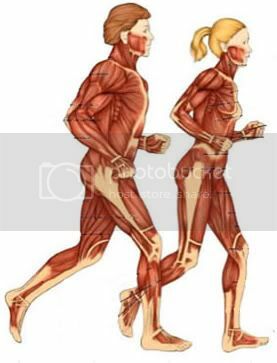 Skeletal muscles attach to the skeleton and come in pairs -- one muscle to move the bone in one direction and another to move it back the other way. These muscles usually contract voluntarily, meaning that you think about contracting them and your nervous system tells them to do so. They can do a short, single contraction (twitch) or a long, sustained contraction (tetanus). Smooth muscle is found in your digestive system, blood vessels, bladder, airways and, in a female, the uterus. Smooth muscle has the ability to stretch and maintain tension for long periods of time. It contracts involuntary, meaning that you do not have to think about contracting them because your nervous system controls them automatically. For example, your stomach and intestines do their muscular thing all day long, and, for the most part, you never know what's going on in there. Cardiac muscle is found only in your heart, and its big features are endurance and consistency. It can stretch in a limited way, like smooth muscle, and contract with the force of a skeletal muscle. It is a twitch muscle only and contracts involuntarily.